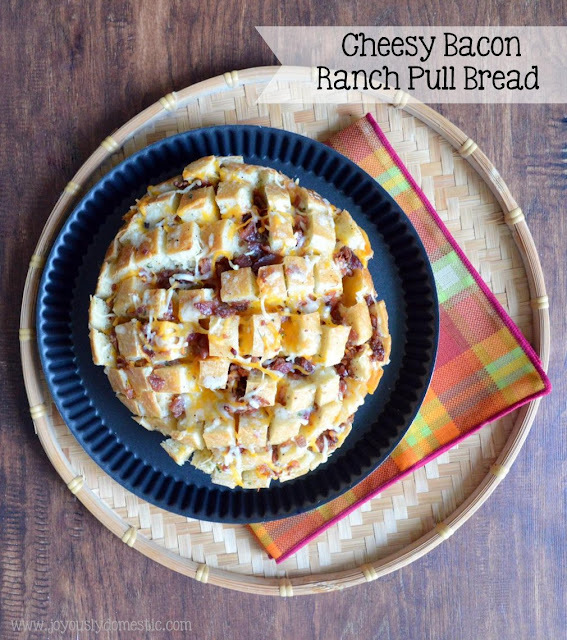 I just had to share this fun, scrumptious pull bread because it is so easy to make and incredibly addicting. It is super quick to assemble and takes less than thirty minutes to bake. It's perfect for snacking on with the family on movie or game night at home. Grab a round loaf of bakery bread. Cut some slices in it. Stuff it with bacon, cheese, butter and ranch mix. Then, wrap it in foil and toss it in the oven. Um, how simple is that? Stuff cheese and bacon down into all the cuts. Mix together melted butter and ranch dressing mix. Pour over bread. Wrap the entire loaf in foil and place on a baking sheet. Bake for 15 minutes. Open foil to expose top half of bread. Bake for an additional 10 minutes or until cheese is fully melted. Serve immediately. 08/05/16: Updated photos and made clarifications to post. I will use it as a reference source. Thank you for sharing. Love bacon bread so so much! Thank you for sharing this! Hi!, really loved this cheesy bacon recipe. The photos you posted here helped me a lot to better understand the cooking process for this recipe. Thank your sharing.